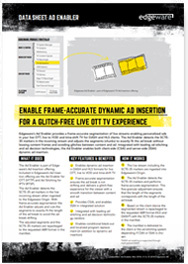 Edgeware’s Ad Enabler provides a frame-accurate segmentation of live streams. This enables personalized ads in your live OTT, live to VOD and time-shift TV for DASH and HLS clients. The Ad Enabler detects the SCTE35 markers in the incoming stream and adjusts the segments (chunks) to exactly fit the ad break without loosing content frames and avoiding glitches between content and ad. Integrated with leading ad stitching and ad decision technologies, the Ad Enabler enables both client-side (CSAI) and server-side (SSAI) dynamic ad insertion.